Warriors is a series of fantasy novels published by HarperCollins. Though the books are published under the fake name of Erin Hunter, who are actually Kate Cary, Cherith Baldry, and the newly-recruited Tui Sutherland, with plot ideas by storyline editor Victoria Holmes. The series follows the adventures of four clans (ThunderClan, ShadowClan, WindClan and RiverClan) of wild cats trying to survive in their forest homes. It currently consists of three miniseries, with a fourth announced, each containing six books. The first, Warriors, was published in 2003–2004, beginning with Into the Wild, and was followed by Warriors: The New Prophecy, published 2005–2006. The third, Warriors: Power of Three, has been underway since April 2007 and its fifth book, Long Shadows, was released on November 25, 2008. The final book of this miniseries, Sunrise, will be released April 21, 2009. The first chapter in the series follows a domesticated cat named Rusty who has strange dreams about life in the forest. Against the warnings of his friend, Smudge, Rusty ventures into the forest, where he is attacked by another cat, later identified as Graypaw. As the fight settles, Rusty is invited to join ThunderClan, one of many warring cat clans. Rusty accepts, leaving his owners behind. In ThunderClan, Rusty is renamed Firepaw after a short bout between him and a young warrior named Longtail. Later on in the series, Fireheart (Firepaw who became a warrior at the end of the first book) discovers a plot by Tigerclaw (the deputy at the time) against the Clan in order to take over it. Fireheart stops him, Tigerclaw is banished, and Fireheart becomes deputy. 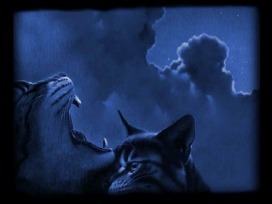 Tigerclaw, however heads to ShadowClan to become leader and becomes Tigerstar. He then plots his revenge against ThunderClan. He releases a pack of dogs on the Clan. Tigerstar then plots to take over all 4 Clans, combining ShadowClan and RiverClan into "TigerClan". After Firestar united ThunderClan and WindClan into "LionClan", Tigerstar sent a warrior named Boulder to recruit BloodClan, a vicious band of cats from Twoleg (human) place. Scourge, the leader of BloodClan, kills Tigerstar with one blow and threatens to take over all the forest. The series draws to a climax when Firestar fights Scourge and BloodClan with all four Clans together as the 'new' LionClan. The books in the series are: Into the Wild, Fire and Ice, Forest of Secrets, Rising Storm, A Dangerous Path, and The Darkest Path. 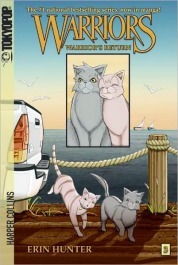 The second series, called Warriors: The New Prophecy, centers around six cats from the four different Clans: The ThunderClan representative, Brambleclaw, the ShadowClan representative, Tawnypelt (Brambleclaw's sister), the WindClan representative Crowpaw (later Crowfeather), and the RiverClan representative, Feathertail, with Feathertail's brother, Stormfur, and the ThunderClan cat, Squirrelpaw (Firestar's daughter, later Squirrelflight), tagging along. A badger named Midnight tells the six that the Twolegs will make the Thunderpath (road) that cuts across the Clans' territories wider and that the Clans would have to leave. On the way back to the forest, they meet a strange group of cats called the Tribe of Rushing Water. A mountain lion named Sharptooth was preying off of the Tribe cats one by one. Feathertail gives her life to kill him and to save Crowpaw and her friends. The remaining five then return to the Clans and report to them the danger. They then lead their clans through the mountains to a safer territory, but on the way, Stormfur falls in love with a cat named Brook Where Small Fish Swim (Brook). Leaving Stormfur with the Tribe of Rushing Water, the rest of the cat's find a lake which has terrain suitable for each clan. In books 4 and 5 Leafpool and Crowfeather start to share romantic feelings for each other. Then in book 5 they run away together, but soon came back due to a badger attack during which Cinderpelt (the current medcine cat) gets killed helping Sorreltail give birth. The series then centers around the prophecy "Before there is peace, blood will spill blood, and the lake will run red". Tigerstar's sons, Hawkfrost and Brambleclaw meet with their father in dreams, and he teaches them how to gain the position of leader. Hawkfrost follows Tigerstar every step of the way, but Brambleclaw is split between loyalty to Firestar and his own ambition. Brambleclaw's friendship with Squirrelflight comes close breaking when she sees how much time he spends with Hawkfrost (not in dreams). The series reaches it's climax when Hawkfrost traps Firestar, and tells Brambleclaw to kill him, Brambleclaw frees Firestar and Hawkfrost attacks Brambleclaw, Brambleclaw wins the fight that follows. The series was released from 2005–2006, and consists of six books: Midnight, Moonrise, Dawn, Starlight, Twilight, and Sunset. The third series, titled Warriors: Power of Three, follows three young cats named Hollyleaf, Jayfeather, and Lionblaze. Jayfeather is blind, and is often looked upon differently by his Clan, but he discovers he has a unique power, as do his sighted siblings. The series centers around the prophecy, "There will be three, kin of your kin, who hold the power of the stars in their paws." As the young cats learn about the Clans and the world around them, they feel increasing pressure to use their abilities- for good or evil, they don't know. In Long Shadows, they learn an amazing secret: Brambleclaw and Squrrielflight aren't their parents. The books in the series are: The Sight, Dark River, Outcast, Eclipse, Long Shadows, and Sunrise. The final book of this series will be released April 20, 2009. The final book was originally titled Cruel Season, but the publisher wanted it changed to Sunrise in order to still keep the book grade school friendly. The fourth series has been renamed as Omen of the Stars. The former series title The Fourth Apprentice will now be used as the title of the first book, instead of the former Book 1 title, Ambush. The series will be a direct continuation from Power of Three. Vicky Holmes (one of the three 'Erin Hunters'), has stated that there will be a new point of view being described in Omen of the Stars, but has not revealed whose viewpoint that is. Though the reader assumes it to be the replacement for one of the three. Like the three series before, this series will have six books. The Fourth Apprentice will be released on November 24, 2009. It has been confirmed by Kate that the second book will be called Echoes. In an author tracker email, it was revealed there would be a new species introduced. This was later confirmed to be beavers, who will be an enemy. 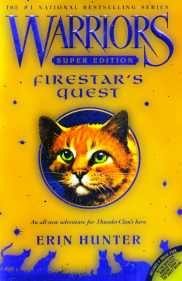 Firestar's Quest, a larger book, was released on August 21, 2007. 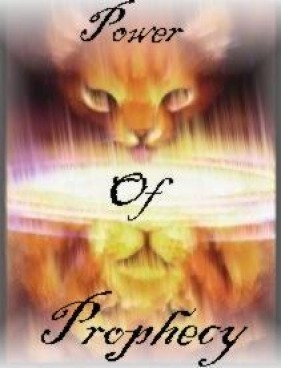 It covers the time between The Darkest Hour and Midnight, and answers many questions as to what happened in between the books, such as Longtail's blindness, Willowpelt's death, the birth of Leafpool and Squirrelflight, and the origins of the prophecy "There will be three, kin of your kin, who hold the power of the stars in their paws.". The book follows Firestar and Sandstorm, who journey to restore SkyClan, the fifth clan of the forest that was driven out when a town was built, and was scattered when it was attacked by rats in it's new home. Three other books are to be released under the Super Edition name. 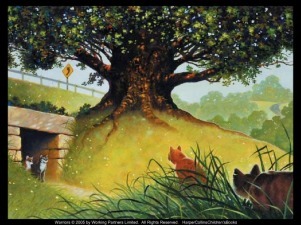 The first will center around the life of former ThunderClan leader Bluestar before Firestar's arrival to the forest, the second will feature the modern-day SkyClan and the third will feature the early days of the Clans. 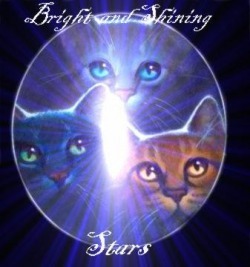 Bluestar's Prophecy will be released July 28, 2009 , the Modern SkyClan Super Edition in 2010, and the Early Clan Days Super Edition in 2011. Secrets of the Clans was the first field guide to be released for Warriors. This book gives more details about the Clans never revealed in the books. Cats of the Clan, featuring illustrations of the cats, was released on June 24, 2008. Code of the Clans, the next field guide, will be released June 9th. There is a three volume original English-language manga series based on what happened to Graystripe between the time that he was taken by Twolegs in Dawn until he returned to ThunderClan in The Sight. It has been published as the first part of a partnership between TOKYOPOP and HarperCollins. It consists of 3 books: The Lost Warrior, Warriors's Refuge, and Warrior's Return. The final volume was published on April 22, 2008. All of this information was gathered at http://en.wikipedia.org/wiki/Warriors_(novel_series). CLICK HERE to view that site for more information!